—Your Beatitude, according to the Ukrainian Constitution, Church is separated from state. When in the early twentieth century the Bolsheviks adopted this law, many believers perceived it as a serious religious catastrophe. However, as it very soon became clear that the Bolsheviks separated Church from state only to busy themselves with the Church’s destruction. Later, in the early 1990s, the situation changed as the communists fell from the historical arena and a time of restoration came for the Church. Here the law on the separation of Church from state played to some extent a positive role: The Church could develop in the necessary direction almost without any pressure from the authorities. But now when the authorities seek to influence the solution of church problems, how would you comment on the developments? Can the government help create a “Unified Local Church”? And how should the faithful react to all of this? —The law on the separation of Church and state is the fruit of revolutionary transformations carried out in the early twentieth century. The Bolsheviks separated the Church from the state in order to show that the country adopted a new, atheistic way of development. This law was also necessary to the Soviet power to untie its hands in its struggle against the Church to the point of its complete destruction. And this struggle was waged under the slogan: “The Church is an enemy of the state”. However, the Lord, Who does everything for the good of His faithful, ordained that the separation of Church and state became a new stimulus for the Church’s powerful development. And we humbly thank the Lord for this mercy to us, unworthy children of His holy Church. Now some politicians are trying to create a unified Local Church in Ukraine. This church is sometimes called Orthodox and sometimes simply ‘Local Church’. It is all the same for politicians, since they do not quite understand it and do not even try to understand. The tragedy of these efforts lies in the two things: First, politicians are by their nature not capable of healing spiritual schisms; by their nature, they can only divide people. Only the clergy, with the help of prayer, humility and Divine love, are capable of uniting people with their different temperaments and worldviews into a unified society called the Church of Christ. Secondly, the state, unfortunately, is pursuing a policy that was adopted after the revolution—that is, a policy of moving people away from God. Some may object and say that our politicians are believers—they pray and visit churches. I do not argue; this is really so. But there are forces that make our believing politicians adopt laws that encourage and perpetuate sin. And if politicians perpetuate lawlessness, then, despite their faith in God and going to church, they go against Christ. They take themselves and people who listen to them away from God. Such politicians also want to tune the Church to the rhythm of their own life. They want to create one local Orthodox church that would cater to them and put people who are going to God on the path they themselves have taken. We love our politicians and respect them but we cannot follow them. Otherwise, we will cease to be a Church and turn into a political organization, and the days of our life will be numbered by God. I will use these words to answer your question of how we, believers, should react to the attempts to create a One Local Orthodox Church: Those who believe in God but at the same time get fixated on a desire to grab onto a Local Church do not trust God but live by their own mind. With this attitude, we will soon arrive at a point when each political force would wish to have its own local church that would obey their party in everything and try to make God fulfill its political desires. In other words, those who believe in God but do not commit themselves to Him wish to submit God to themselves, and think it can be done through the creation of a One Local Church. But if one not only believes in God but also commits oneself to God, then one seeks the will of God, remembering that all people are children of God. One wishes to live in peace with everybody and to find Christ in one’s life, Who is our life, the beauty of our life and its meaning. These people do not seek a Local Church—they build and decorate the inner church of their souls each day. Live piously, work on subjecting yourselves to Christ, fulfill His holy commandments, which for us are the light, the way leading us to eternal life. In this way you will find your personal autocephaly—that is, the freedom from sin. And perhaps you will also meet a Local Church but it will be quite unlike the one that politicians try to build. It will be filled with love, peace and joy in the Lord. It will not be a political Church but the Church of Christ, the Church that the gates of hell will never be overcome. —If the Tomos on the recognition of the schismatics by the Ecumenical Patriarch will in fact be granted, how should we react to this news and build our relations with these religious organizations? —If the Tomos on the Patriarch of Constantinople’s recognition of the schismatics is granted, then it will generate new schisms, larger and deeper. These schisms will affect not only our Ukraine—they will affect the whole world Orthodox Church. I will briefly explain how this will happen. First, according to Orthodox canons, the deeply esteemed Church of Constantinople has no right to give autocephaly to a Church that is not in her jurisdiction today. The title of “Mother Church”, which is very often used today, does not give the canonical right to intrude upon the spiritual life of a “daughter Church”, which was separated from the “Mother” ages ago and has de facto lived her own spiritual life. And if we take into account that the “Mother Church” itself is suffering from her own deepest schism because of which the Orthodox Byzantine Empire has become a country in which Islam is confessed today, then it would be appropriate to recall the words of the holy Gospel: Physician, heal thyself! (Lk. 4:23). If a physician, who, regrettably, is himself seriously ill and for this reason has no right to treat others, still dares to act, then it will only give birth to greater lawlessness in the form of a global schism in Orthodoxy. As to the attitude to a religious organization born of lawlessness, I will answer with the words of Psalmist David: lest the righteous stretch forth their hands unto iniquities (Ps. 125:3). —Holy Scripture says that “all power comes from God.” How should we understand these words? For instance, if power is from God, then should a Christian fully obey this power? If yes, then in what cases? But if the power is such as it was fifty years ago,1 how should we perceive it? And generally, in what cases can and must a Christian fulfill the commands of powers that be? —Indeed, all power comes from God. But God does not give us power in our hands to be arbitrary, to do as we wish, but for us to fulfill what God wills, for us to live according to the commandment of Divine love and to teach our subordinates to live that way. Unfortunately, when we receive power, all this is often forgotten. Power blinds us, and then we think we can do whatever we want. We should not think that way. With great power comes great responsibility. We will give an account before God For the way we bore our cross. It is the Savior Himself Who has given an answer to the question of how we should treat power if it does not do as we wanted it to do: Render therefore unto Caesar the things which are Caesar’s; and unto God the things that are God’s (Matt. 20:21). That is, give the authorities all the earthly things—taxes, work, patience, respect; but your hearts you give to God. On the other hand, if the authorities begin acting arbitrarily, we should not disdain or hate them for that; we should pray for the authorities. We should pray to the Lord that He might give our leaders the grace of the Holy Spirit, Who will help them bear their cross in the proper way. —If a parish priest asks to read the burial service or give communion to those who were baptized in a church of the “Kiev Patriarchate”, what is the right response to this request? Perhaps it is more logical that our priests should bear responsibility only for those who are in their pastoral care and who are in the area of their immediate pastoral concern? —Concerning question about reading burial services for those who were “baptized” by the schismatics, the answer is clear: Those baptized in the canonical Church have thus testified to their wish to be also buried by that Church. But if a person is “baptized” in a schismatic church, he thereby expressed his desire to be sent to the next life by it. We do not read burial services for schismatics because we do not want to violate their freedom of choice. In life, however, each individual case has an underlying meaning. And before refusing a request, a canonical priest should thoroughly clarify all the reasons why the deceased had chosen a different faith. If in doing so, a priest finds arguments associated with a human weakness, not the deceased’s fanatical stubbornness, then he has the right to show economy, that is, a concession, with a blessing from his bishop. —Many are concerned over the continued life of canonical Orthodoxy in Ukraine. What should disturb us most of all at this time—the fate of the Church or the fate of our souls and the confession of our personal faithfulness to Christ? —Indeed, our Ukrainian Orthodox Church is going through a difficult time. But for our consolation, I would like to remind you that the earthly Church has no easy times. Even when all is calm around it, when we are praised, it is still a hard time for the Church. And this complexity lies in that praise and wellbeing make us lazy and careless, and this leads us to spiritual degradation and decline. For this reason, even in times of wellbeing we should struggle with ourselves and force ourselves to stay alert, so that spiritual slackness may overcome us. We must force ourselves to pray constantly and repent of our unworthiness, and humbly thank the Lord for not turning His Divine Face away from us, but rather surrounds us with His mercies and blessing—of which we are only able to see a tiny, insignificant part, while all the rest we neither see nor understand. Those who will this so will have peace and joy in their souls. And they will not depart from the True Church of Christ, which will be on earth till the end of time. —Your Beatitude, today our Church and our people are going through a hard time. What do you wish most of all for our flock as a blessing and edification? —Hold on to the Church that cherishes the purity and integrity of the Orthodox faith, and in all the rest things Cast thy care upon the Lord, and He will nourish thee (Ps. 54:53). Live according to the commandments of God and look after your steps so that they may be directed according to the word of the Lord, and commit all people into the hands of God. He has the power to correct human steps. 1 That is, communist power, which warred against God. 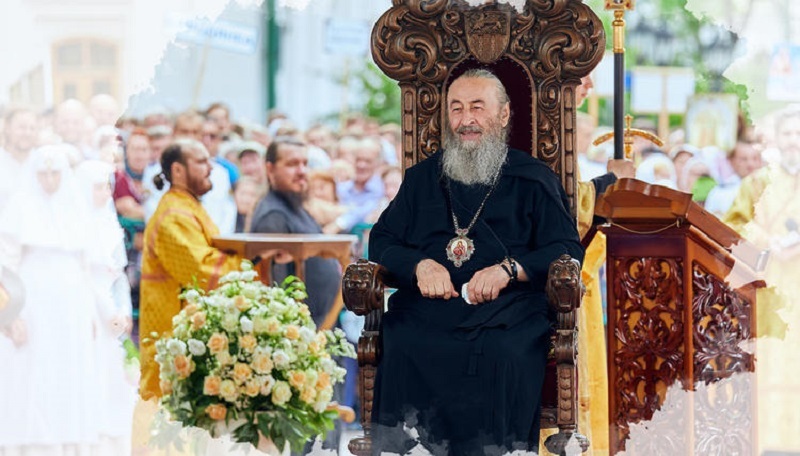 The hierarchs and clergy of a number of dioceses of the Ukrainian Orthodox Church have explicitly expressed their support for the position of the canonical Ukrainian Orthodox Church and their archpastor His Beatitude Metropolitan Onuphry of Kiev and All Ukraine. "Those who initiated autocephaly do not want peace in our land"
Mnogaya lyeta (many years) to our beloved Metropolitan Onuphry! Truly remarkable person the Lord sent to His Church in Ukraine in these most evil times.